Spend the night aboard the iconic Milford Mariner and wake up to dawn in one of the most beautiful places on earth. The cruise style is relaxed, allowing plenty of time to view the fjord’s spectacular waterfalls, rain forest, mountains and wildlife. The Milford Mariner anchors in a sheltered cove, where guests can join the nature guide and explore in the vessel’s tender craft and kayaks. As evening falls, enjoy a delicious carvery buffet in the dining saloon, prepared freshly by the on board chef. Then relax in the company of fellow travelers or indulge in some star gazing before retiring to a private cabin. In the morning, dig into a hearty breakfast before heading back out to the Tasman Sea and exploring more of the fjord. 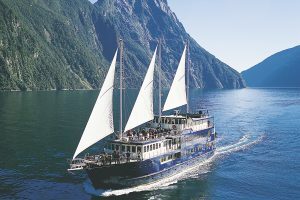 The Mariner is the ultimate Milford Sound experience! The guides explain the history and geology of the area and are on hand to answer questions. Explore nature’s colors in New Zealand’s magnificent South Island paradise. Nature’s eye candy awaits as you fly west over the high country peaks of New Zealand;s Queenstown. 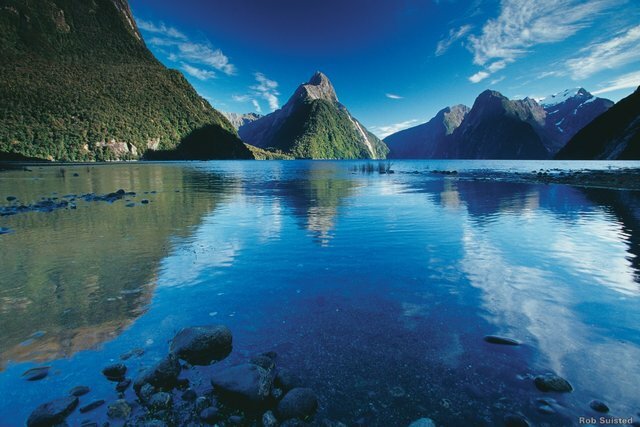 Enjoy the clear waters of majestic lake at Milford Sound. Lunch at the historic Arrowtown after bumping along on a 4WD buggy ride. Visit jaw dropping Milford Sound – a water inlet carved out by the movement of glaciers a few thousand years ago. Explore our signature off-the-beaten path experiences and an in-depth spirited journey. Wander through the heart of downtown Queenstown with lake views, signature shores, bars and restaurants. Explore nature’s colors in the magnificent South Island. South Island Hiker’s Paradise New Zealand is home to the phenomenal southern alps, a mountain range that runs down the entire island with some seriously spectacular peaks, stunning beaches, rain forests, glaciers, and New Zealand’s largest national park. Check out Franz Josef or Fox (or both) glaciers, which are remarkably close to the ocean. Experience Fiordland national park, the largest of New Zealand’s fourteen national parks and a UNESCO World Heritage Area. Jaw dropping Milford Sound, a water inlet carved out by the movement of glaciers a few thousand years ago. The peaks that this glacial activity left behind are stunning. It truly has to be seen to be believed, and you’ll need to take one of the Milford Sound cruises to make that happen. Our signature off-the-beaten path experiences and an in-depth spirited journey. Imagine the most glorious scenery of New Zealand’s north and south Island. Experience Hawke’s Bay New Zealand eclectic mix of visual and sensual. experiences and an area that is New Zealand’s leading producer of red wines. Marvel at the greatest concentration of Art Deco architecture below the equator. Don’t miss Cape Kidnappers, home to the largest accessible gannet colony in the world, perched on the edge of a rugged coastline. Walk, hike or bike along the miles of nature trails and if you get a clear day, you can see as far as volcano of Ruapehu in the distance. Queenstown New Zealand presents an eclectic mix of visual and sensual experiences. Queenstown New Zealand offers year-round travel excitement, a skiing paradise in the winter and a hiking heaven in the summer. Gateway to Milford Sound with jaw-dropping natural scenery. bonded and licensed in Quebec.